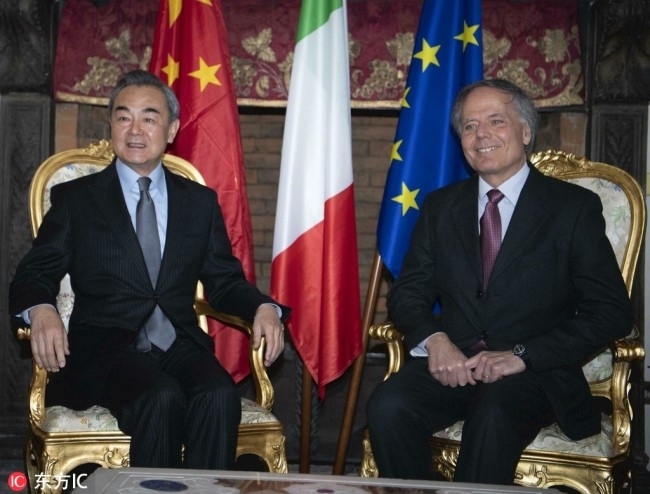 Visiting Chinese State Councilor and Foreign Minister Wang Yi on Friday held talks with Italian Foreign Minister Enzo Moavero Milanesi, with both pledging closer cooperation. Wang called on both China and Italy to promote more top-level communication, strengthen pragmatic cooperation within the framework of the Belt and Road Initiative (BRI), and assured business communities in both countries of a strong commitment for win-win cooperation in the long run. This year marks the 15th anniversary of the bilateral comprehensive strategic partnership between China and Italy, and next year marks the 50th anniversary of diplomatic ties. Wang said the two countries should make use of these opportunities to bolster ties. Wang also stressed that China's opening-up will go further and provide more opportunities for countries including Italy. China wants more Italian corporate investors to enter the Chinese market. During their talks, Moavero said Italy and China are countries of cultural wealth and economic complementarity, in addition to having a long history of friendship. Moavero said his country looks forward to closer top-level exchanges with China, as well as enhanced cooperation. Italy welcomes more Chinese high-tech products and corporate investors in its market, said the Italian foreign minister.